The Mississippi River, derived from the Ojibwa (Chippewa Indian) language meaning “great river” or literally, “river of the falls,” is the second-longest river in North America, meandering from Lake Itasca in northern Minnesota to the Gulf of Mexico in Louisiana, a journey of over 2,300 miles. The longest river in North America is its tributary, the Missouri River, with a length of 2,341 miles (3,767 kilometers) from the confluence of the Jefferson River, Madison River and Gallatin River to the Mississippi River. Taken together, the Jefferson, Missouri, and Mississippi form the largest river system in North America with a length of 3,745 miles, making this combination the third-longest river in the world behind the Nile and Amazon rivers. It is the largest river in the Northern Hemisphere. The Mississippi drains all or part of 31 U.S. states and three Canadian provinces and is thus one of the largest watersheds in the world. One of the most diverse communities of plants and wildlife in the world exist along the Mississippi. It has one of the largest wetlands in the U.S., visited by 40 percent of all the ducks, geese and swans of North America. A habitat for many plants and animals that are not found elsewhere in the world, such as the paddlefish, it is also a roadmap guiding millions of migratory birds and waterfowl to and from their wintering grounds every year. Countless other wildlife use the river and its floodplain as habitat. More than three hundred species of fish are supported by the Mississippi. The Mississippi River is 2,348 miles long, the second-longest river in the United States after the Missouri River. 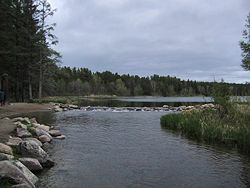 Its source begins at Lake Itasca, 1,475 feet (450 meters) above sea level in Itasca State Park, Minnesota. The river falls to 725 feet (220 meters) just below Saint Anthony Falls in Minneapolis; the only waterfall along the river's course. The Mississippi passes through several glacial lakes, pine forests, vegetation and cattail marshes before it is joined by tributaries. The retention time from its beginning at Lake Itasca to the end at the Gulf of Mexico is about 90 days. The Minnesota River and the Illinois River are among the first to join the Mississippi. The Missouri River joins the Mississippi near St. Louis, Missouri. 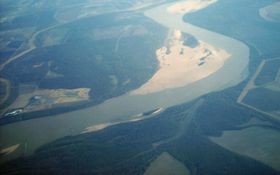 Sometimes referred to as "The Big Muddy," it is the Mississippi's second largest tributary by volume. The Mississippi is also joined by the Ohio River at Cairo, Illinois and the Arkansas River near Arkansas Post, Arkansas. The Atchafalaya River in Louisiana is a major distributary of the Mississippi. Its triangular drainage area covers about 40 percent of the U.S. and includes all or part of 31 states. It drains most of the area between the Rocky Mountains and the Appalachian Mountains except for the areas drained by Hudson Bay via the Red River of the north, the Great Lakes and the Rio Grande. The Mississippi forms the borders of eight states: Wisconsin, Iowa, Illinois, Missouri, Kentucky, Arkansas, Tennessee and Mississippi. It runs through two others: Minnesota and Louisiana. The river empties into the Gulf of Mexico about 100 miles (160 kilometers) downstream from New Orleans, Louisiana. A series of 29 locks and dams on the upper Mississippi, most of which were built in the 1930s, is designed primarily to maintain a nine-foot (2.7 meter) deep channel for commercial barge traffic. The lakes formed are also used for recreational boating and fishing. The dams make the river deeper and wider, but do not stop it. During periods of high flow, the gates, some of which are submersible, are completely opened and the dams simply cease to function. Below St. Louis, the Mississippi is relatively free-flowing, although it is constrained by numerous levees and directed by numerous wing dams. Through a natural process known as deltaic switching, the lower Mississippi River has shifted its final course to the ocean every thousand years or so. This occurs because the deposits of silt and sediment raise the river's level causing it to eventually find a steeper route to the Gulf of Mexico. The abandoned distributary diminishes in volume and forms what are known as bayous. This process has, over the past five thousand years, caused the coastline of south Louisiana to advance toward the Gulf from 15 to 50 miles (25–80 kilometers). The Mississippi River Delta Basin is defined as all of the land and shallow estuarine area between the two northernmost passes of the Mississippi River and the Gulf of Mexico. The basin is located in Plaquemines Parish, Louisiana, south of the city of Venice. The Illinoian Glacier, about 200,000 to 125,000 years before present, blocked the Mississippi River near present-day Rock Island, Illinois, diverting it to its present channel farther to the west, the current western border of Illinois. The Hennepin Canal roughly follows the ancient channel of the Mississippi downstream from Rock Island to Hennepin. South of Hennepin, Illinois, the current Illinois River is actually following the ancient channel of the Mississippi River (to Alton, Illinois) before the Illinoian glaciation. Other changes in the course of the river have occurred because of earthquakes along the New Madrid Fault Zone, which lies between the cities of Memphis, Tennessee and St. Louis, Missouri. Three earthquakes in 1811 and 1812, estimated at approximately 8 on the Richter Scale, were said to have temporarily reversed the course of the Mississippi. These earthquakes also created Reelfoot Lake in Tennessee from the altered landscape near the river. The faulting is related to a failed rift (aulacogen) that formed at the same time as the Gulf of Mexico. The Mississippi River has the third largest drainage basin in the world, exceeded in size only by the watersheds of the Amazon and Congo rivers. It drains 40 percent of the 48 contiguous states of the United States. The basin covers more than 1,250,000 square miles (3,225,000 square kilometers), including all or parts of 31 states and two Canadian provinces, Manitoba and Ontario, or one-eighth of North America. Major sub-tributaries include the Tennessee River (a tributary of the Ohio River) and the Platte River (a tributary of the Missouri River). In the 1960s and early 1970s, there were few regulations controlling what went into the river. DDT, a chemical used in fertilizers was a dangerous pollutant. During that time, the American Bald Eagle was nearly extinct, with only one nest in the Upper Mississippi River Wildlife Refuge. With the use of management and regulations, there are about 130 nests in the Refuge today. There are also about three hundred bird species and 119 fish species living along and in the upper Mississippi River. The river affords homes for heron, egrets and large flocks of canvasback ducks. One can also see beautiful tundra swans and white pelicans along the river banks. Approximately 3.5 million people visit the upper Mississippi River Wildlife Refuge each year. The Mississippi, its tributaries and waterways are visited by 40 percent of all ducks, geese, swans and eagles of the United States. 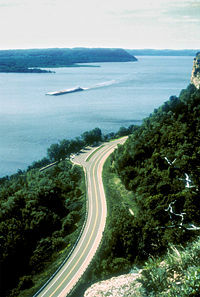 The Great River Road allows visitors to travel on its roadways and view 2,069 miles (3,229 kilometers) of scenic splendor through Arkansas, Illinois, Iowa, Minnesota, Mississippi, Missouri, and Wisconsin. Approximately 12 million people live in the 125 counties and parishes along the Mississippi River. The Mississippi River Valley brings in $7 billion from forest and agriculture products and $29 million from manufacturing each year. Approximately 470 million tons of cargo are moved on the Mississippi each year. Wheat from the Midwest and petro-chemicals from the Gulf of Mexico are among its major transports. U.S. government scientists determined in the 1950s that the Mississippi River was starting to switch to the Atchafalaya River channel because of its much steeper path to the Gulf of Mexico, and eventually the Atchafalaya River would capture the Mississippi River and become its main channel to the Gulf. As a result, the U.S. Congress authorized a project called the Old River Control Structure, which has prevented the Mississippi from leaving its current channel that drains into the Gulf via New Orleans. Because of the large scale of high-energy water flow through the structure threatening to damage it, an auxiliary flow control station was built adjacent to the standing control station. This $300 million project was completed in 1986 by the Army Corp of Engineers. This has actually caused many problems in the Mississippi River Delta Basin area in creating massive land loss. There are two plans in consideration designed to reverse the damage. One is the uncontrolled diversion of the Mississippi River for the creation of a new delta, while maintaining the navigation route in its present location. The other plan is that of managing the retreat of the existing delta. The second strategy would maintain the course of the river in its present location and would optimize the growth of the existing delta through redistribution of the available flows and sediments. The Mississippi discharges at an annual average rate of between 200,000 and 700,000 cubic feet per second and releases about 400 million yards of mud, sand, and gravel per year. Although it is the fifth-largest river in the world by volume, this flow is a mere fraction of the output of the Amazon, which moves nearly 7 million cubic feet per second during wet seasons. On average the Mississippi has only one-eleventh the flow of the Amazon River, but is nearly twice that of the Columbia River and almost six times the volume of the Colorado River. Fresh river water flowing from the Mississippi into the Gulf of Mexico does not mix into the salt water immediately. Images from NASA's MODIS (Moderate-resolution Imaging Spectroradiometer) show a large plume of fresh water, which appears as a dark ribbon against the lighter-blue surrounding waters. The Mississippi continues around the tip of Florida before it mixes thoroughly with the salt waters of the ocean. There is an ongoing effort to keep saltwater out of the Mississippi's fresh water before it enters the ocean. Saltwater wreaks havoc on the delicate habitat of fresh water biospheres inland. Over the past 50 years, the sediment load of the Mississippi River Delta Basin has been drastically reduced by a combination of natural and human-induced factors. Natural factors include events such as hurricanes, tidal erosion, and sea-level rise. In 2005, Hurricane Katrina destroyed 700,000 acres of wetland habitat. Some areas of the Mississippi River Delta Basin, such as the Chandeleur Islands, lost about half of their land mass as a result of the powerful storm surge. Prior to European settlement, many Native American tribes inhabited the floodplain areas of the Mississippi River and used the river as a highway to sustain their villages and as a geological marker. They had an active relationship with the river, understanding its dynamic nature and how to work with it. The name Mississippi is of Ojibwa origin, from Missi, meaning great, being akin to the more modern Kitchi or Gitchi plus Zibi, meaning the "Great River." Literally it means "River-of-the-Falls." To the Ojibwa (or Chippewa), the Mississippi only becomes so below the junction of Leech Lake River, not Itasca as designated by the whites. Lake Itasca was the O-mush-kozo Sa-Gai-igan, "Elk Lake," and the stream running out, the O-mush-kozo Zibi, "Elk River." Rivers follow the general rule of taking the name of their immediate source lake. When reaching Lake Bemidji, Cass and Winnibigoshish, this stream changed its name three more times and not until the outlet of Leech Lake is reached is it considered, by the Ojibwa, to be the Mississippi. On May 8, 1541, Hernando de Soto became the first recorded European to reach the Mississippi River, which he called "Rio de Espiritu Santo" (“River of the Holy Spirit”). This name is currently the name of the river in the Spanish-speaking world. French explorers Louis Joliet and Jacques Marquette were the first to make the river known to the European world through their voyage down the river from the mouth of the Wisconsin to the mouth of the Arkansas in 1673. In 1682 René Robert Cavelier, Sieur de La Salle and Henri de Tonty claimed the entire Mississippi River Valley for Louis XIV of France. They called the river Colbert River after Jean-Baptiste Colbert. France lost all its territories on the North American mainland as a result of the French and Indian War. The Treaty of Paris (1763) gave the Kingdom of Great Britain rights to all land in the valley east of the Mississippi and Spain rights to land west of the Mississippi. In the second Treaty of Paris (1783), Spain had control over the river south of 32°30' north latitude and, in what is known as the Spanish Conspiracy, hoped to gain greater control of Louisiana and the entire west. These hopes ended when Spain was pressured into signing Pinckney's Treaty in 1795. France reacquired Louisiana from Spain in the secret Third Treaty of San Ildefonso in 1800. The United States bought the territory from France in the Louisiana Purchase of 1803. The river played a decisive role in the American Civil War. The Union's Vicksburg Campaign called for Union control of the lower Mississippi River. The Union victory at the Battle of Vicksburg in 1863 was pivotal to the Union's final victory of the Civil War. Soon thereafter, a way was sought to tame the river for use as a transportation system of goods and people. In the late 1800s snags were removed from the channel so large steam boats could pass more easily. At the beginning of the twentieth century, thousands of rock and willow mat wing-dams were installed to constrict the current and scour out a navigable channel. During the 1920s to 1940s, 27 lock and dams were erected to maintain the channel at a depth of four feet deep year-round. A channel of 11.5 feet is maintained (though the Army Corps of Engineers has permission from Congress to maintain the channel at 9 feet) to support the current barges that run the Mississippi. These dams have turned the river into a series of lake-like pools. Initially these dams inundated parts of the floodplain and created habitat for many species of fish and wildlife. Now these same wetlands are being flooded out by the continually high water levels due to the locks and dams. Rough rafts made of logs, known as keel boats, were the early form of transportation on the Mississippi. These slow moving boats were replaced with the onset of the steam engines. The first steamboat to travel the full length of the Mississippi from the Ohio River to New Orleans, Louisiana, was the New Orleans, designed by Robert Fulton and Robert Livingston in 1811. Its maiden voyage occurred during the series of New Madrid earthquakes in 1811–1812. By 1814 the New Orleans maintained a passenger and a cargo route, running between New Orleans, Louisiana, and Natchez, Mississippi. Its speed was about eight miles per hour downstream and three miles per hour upstream. The invention of the combustible engine in the mid-nineteenth century greatly sped up river travel. Along with it came the invention and use of tow-boats and barges. The amount of cargo that one 15-barge tow could move was equal to approximately the ability of nine hundred semi-trucks, with only ten percent of fuel usage. In 1848, the Illinois and Michigan Canal was built to connect the Mississippi River to Lake Michigan via the Illinois River near Peru, Illinois. In 1900, the canal was replaced by the Chicago Sanitary and Ship Canal. The canal allowed the city of Chicago to address specific health issues (typhoid, cholera and other waterborne diseases) by sending its waste down the Illinois and Mississippi river systems rather than polluting its water source of Lake Michigan. The canal also provided a shipping route between the Great Lakes and the Mississippi. In 1913, construction was complete on a dam at Keokuk, Iowa, the first dam below St. Anthony Falls. Built by a private power company to generate electricity, the Keokuk dam was one of the largest hydroelectric plants in the world at the time. Besides producing electricity, this dam eliminated the Des Moines Rapids. The locks and dams constructed in the 1920s through 1960s extended the head of navigation for commercial traffic several miles. Ocean liners can travel up as far inland as Baton Rouge, Louisiana. Most barges travel as far Saint Paul and few venture farther. Prior to the 1927 flood, the primary strategy to stop flooding was to close off as many side channels as possible to increase the flow in the main river. It was thought that the river's velocity would scour off bottom sediments, deepening the river and decreasing the possibility of flooding. This theory was proven wrong by the 1927 flood. Many communities threatened by the flood began to construct their own levee breaks to relieve the tension of the rising river. The Great Flood of 1993 was another significant flood, although it primarily affected the Mississippi above its confluence with the Ohio River at Cairo, Illinois. The Army Corps of Engineers now actively creates floodways to divert periodic water surges into backwater channels and lakes. There are four major types of flood control used on the Mississippi. Embankments, including "wing" dams made of concrete, stones or various materials. This has proved to be one of the cheaper means of flood control and reduces erosion along the riverbanks. Water diversion methods such as locks and dams. The main floodways are the Birds Point-New Madrid Floodway; the Morganza Floodway, which directs floodwaters down the Atchafalaya River; and the Bonnet Carré Spillway which directs water to Lake Pontchartrain. The Old River Control structure also serves as major floodgates that can be opened to prevent flooding. Monitoring and regulation of the rivers carrying capacities. The Upper Mississippi River has naturally maintained equilibrium between its channel and backwater areas since the last glacial retreat. As sediment filled up one area, the river would meander and create a new channel. This dynamic mechanism of constant change and self-renewal created a diverse and rich river ecosystem. This system of self-renewal has ceased due to locks, dams and other river control structures created since the 1800s. The main channel has been locked into one position, preventing it from meandering and creating new aquatic areas. By diverting all current to the main channel, water in the backwaters is slowed down, increasing the rate of sedimentation. The lock and dam system has turned a dynamic river system into something that resembles a long series of lakes, which are filling up with silt. The result of commercialization of the river and the development of navigation is that one of the most complex ecosystems on earth is dying. Due to upland soil erosion, channelization, and management practices that favor navigation, the backwaters and non-channel water areas are filling up with sediment at the rate of one-half to two inches a year. Biologists from state and federal agencies have warned since the 1970s and 1980s that the build-up of silt and sand will completely destroy the Upper Mississippi River's ecosystem if it is not stopped. However, the expansion of the commercial navigation system is still being pursued due to commercial interests. Biologists warn that an ecological collapse would likely occur of the Upper Mississippi River if the current systems expand or even just continue as is. There must be better ways to both manage and utilize this great river, respecting the integrity of its ecosystem. The first bridge across the Mississippi River was built in 1856. 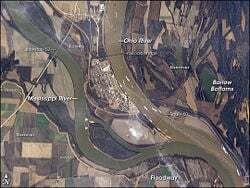 It spanned the river between Arsenal Island at Rock Island, Illinois and Davenport, Iowa. Steamboat pilots of the day, fearful of competition from the railroads, considered the new bridge "a hazard to navigation." Two weeks after the bridge opened the steamboat Effie Afton rammed part of the bridge and started it on fire. Legal proceedings ensued—with a young lawyer named Abraham Lincoln defending the railroad. The lawsuit went all the way up to the Supreme Court, and was eventually ruled in favor of Lincoln and the railroad. 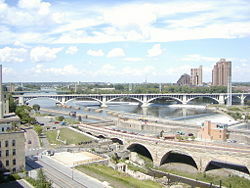 Stone Arch Bridge – a former Great Northern Railroad (now pedestrian) bridge in Minneapolis and National Historic Engineering Landmark. Black Hawk Bridge, connecting Lansing, Iowa and Allamakee County, Iowa to rural Crawford County, Wisconsin, locally referred to as the Lansing Bridge and documented in the Historic American Engineering Record. 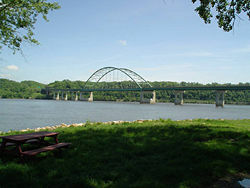 Julien Dubuque Bridge – A bridge connecting Dubuque, Iowa and East Dubuque, Illinois that is listed in the National Register of Historic Places. Interstate 74 Bridge connecting Moline, Illinois to Bettendorf, Iowa is a twin suspension bridge, also known historically as the Iowa-Illinois Memorial Bridge. Rock Island Government Bridge connecting Rock Island, Illinois to Davenport,Iowa located just southwest of the site of the first bridge across the Mississippi River, it is one of only two bridges in the world with two sets of railroad tracks above the auto lanes. It also co-located with Lock and Dam No. 15—the largest roller dam in the world. Rock Island Centennial Bridge connecting Rock Island, Illinois to Davenport, Iowa. Fort Madison Toll Bridge (or Santa Fe Bridge) – in Fort Madison, the largest double-deck swing-span bridge in the world; It is the last operating swing bridge over the Mississippi River for automobile traffic and is listed in the National Register of Historic Places. Clark Bridge (also known as the "Super Bridge" as the result of an appearance on PBS program Nova) – This cable-stay bridge constructed in 1994 connects Alton, Illinois to Black Jack, Missouri. It is the northernmost river crossing in the St. Louis metropolitan area and is named after explorer William Clark. Chain of Rocks Bridge – A bridge on the northern edge of St. Louis, Missouri; famous for a 22-degree bend halfway across and the most famous alignment of Historic US 66 across the Mississippi. Eads Bridge – A bridge connecting St. Louis, Missouri and East St. Louis, Illinois; the first major steel bridge in the world, and also a National Historic Landmark. Hernando de Soto Bridge – carries Interstate 40 to connect Memphis, Tennessee and West Memphis, Arkansas; listed in Guinness Book of World Records for its unique structural "letter" shape. Frisco Bridge – was the first crossing of the Lower Mississippi and the longest cantilever truss steel railroad bridge in North America when it opened on May 12, 1892. It connects Memphis, Tennessee and West Memphis, Arkansas and is listed as a Historic Civil Engineering Landmark. Memphis-Arkansas Memorial Bridge – the longest Warren truss- style bridge in the United States which carries Interstate 55 to connect Memphis, Tennessee and West Memphis, Arkansas; also listed on the National Register of Historic Places. Huey P. Long Bridge – Jefferson Parish, Louisiana, the first Mississippi River span built in Louisiana. ↑ 1.0 1.1 Median of the 7,305 daily mean streamflows recorded by the USGS for the period 1978–1998. ↑ Median of the 7,305 daily mean streamflows recorded by the USGS for the period 1978–1998 at Vicksburg. The discharge is probably even higher farther downstream at Natchez, MS, but data for Natchez were not recorded. Farther downstream from Natchez, approximately 25 percent of the water discharge of the Mississippi is diverted into the Atchafalaya River, and further discharge is lost as the river becomes a delta in Louisiana. ↑ Median of the 1,826 daily mean streamflows recorded by the USGS for the period 1978-1983 at Baton Rouge. ↑ 4.0 4.1 Mississippi River Delta Basin: Summary of Basin Plan, Louisiana Coastal Wetlands Conservation and Restoration Task Force. Retrieved March 31, 2007. ↑ Mississippi River, Visit Bemidji. Retrieved December 31, 2007. ↑ See America’s Byways: Great River Road, SeeAmerica.org. Retrieved December 31, 2007. ↑ Mississippi River Anatomy, America's Wetland Resource Center. Retrieved December 31, 2007. ↑ The Mississippi River Delta, WGBH Educational Foundation. Retrieved December 31, 2007. ↑ Paul Durand, Ha-Ha Wa-Kpa (Mississippi River-Dakota), The Dakota Society. Retrieved December 31, 2007. ↑ The Mighty Mississippi, Mississippi River Revival. Retrieved December 31, 2007. ↑ Mary Bellis, “The History of Steamboats,” About.com. Retrieved December 31, 2007. 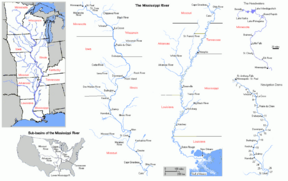 ↑ The Army Corps, Barges, Locks and Dams,, Mississippi River Revival. Retrieved December 31, 2007. This page was last modified on 10 October 2018, at 15:08.